Tractor, Loader and Backhoe – Super Special! Why buy Del Morino Implements? Prices include GST. Finance available TAP, conditions apply. Finance terms: 5.99% interest, no deposit over 60 months. *ABN holders only. Delivery fees will vary depending on location. Choose $2,000 of additional AGMAX implements FREE with any advertised tractor package! The Farmtrac 9120 DTn is manufactured in Europe with world-class components including a Perkins engine, Carraro transmission, Bosch fuel injection system and Mita hydraulics. It offers exceptional build quality and reliability at a superb price, based on it’s superior drive train, hydraulic and electrical systems. The Farmtrac 9120 DTn has an excellent cabin, offering first class protection and comfort, all year round. With quality soundproofing, heating and air conditioning, modern instrumentation, premium pneumatic seat, front and rear work lights for night work and a host of other features, the Farmtrac is a brilliant tractor and fully supported by SOTA’s renowned customer service. The Farmtrac 9120 DTn has a four-wheel braking system, employing state-of-the-art technology for superior stopping power at highway speeds and on hilly, wet terrain. The Farmtrac 9120 DTn is ideal for medium sized properties and commercial operations such as dairy farms, where maximum up-time and versatility are the most important considerations. A heavy duty 4-in-1 front end loader and quality wheel kit are standard. The Farmtrac 9120 DTn is a premium cabin tractor at a highly competitive price. As the direct importer of the Farmtrac range, SOTA is able to offer these quality tractors far cheaper than comparative machines. The general rule of thumb is $1000 per unit of horsepower for a premium cabin tractor. The Farmtrac 9120 DTn costs many thousands of dollars less than the competition! Just delivered! Justin Clark checks out his new Farmtrac 9120DTn - NSW, 2017. Climbing into the cabin is easy with staired steps. Justin operates the 4-in-1 bucket on his Farmtrac FT9120DTn. Justin demonstrates the high lift of the Farmtrac 9120DTn. The side-pull, quick release on the Farmtrac, makes changing attachments safe and fast. Justin Clark - "All good!" The Farmtrac DT series is manufactured in Europe, utilising high-end componentry. Equipped with a world-renowned Perkins engine. Farmtrac 9120DTn installed at the farm - QLD, 2017. SOTA delivers to your farm, from Perth to Hobart! The Farmtrac 9120 DTn offers high quality componentry, modern instrumentation and operator comfort. It is built on a rugged, cast iron chassis for years of heavy duty, all-season applications. The Farmtrac 9120 DTn cabin tractor is ideal for medium to larger sized properties where maximum up-time and versatility are the most important considerations. The premium cabin offers first class protection all year round, with soundproofing, heating and air conditioning as well as front and rear work lights, for night work. A quality SONY stereo music system is also provided. With a pneumatic seat for driver comfort, triple hydraulic remotes and a full lighting and instrumentation system, the Farmtac 9120 DTn is an all-seasons specialist and is suitable for road registration. The Farmtrac DT series employs state-of-the-art technology for superior stopping power at highway speeds and on hilly, wet terrain. When the Farmtrac’s brakes are applied, the braking process is translated through the driveline to the front wheels. 4WD is automatically activated, indicated by a light on the dash. Once the brake pedal is released, the tractor will automatically return to 2WD. This is an excellent safety feature on hilly farms, especially on wet grass where weight on the back of the tractor may cause slippage. The Farmtrac 9120DTn offers a quality weatherproof cabin with excellent work area vision. With heating, air-conditioning and a comfortable pneumatic seat, operate your Farmtrac tractor day in and day out, in any season. Mita hydraulics with triple remotes to suit backhoes, wood splitters, post drivers, etc. Bucket quick release is located at the side of the L/H loader arm. Connect/disconnect the bucket without reaching to the centre of the bucket; quick and safe. 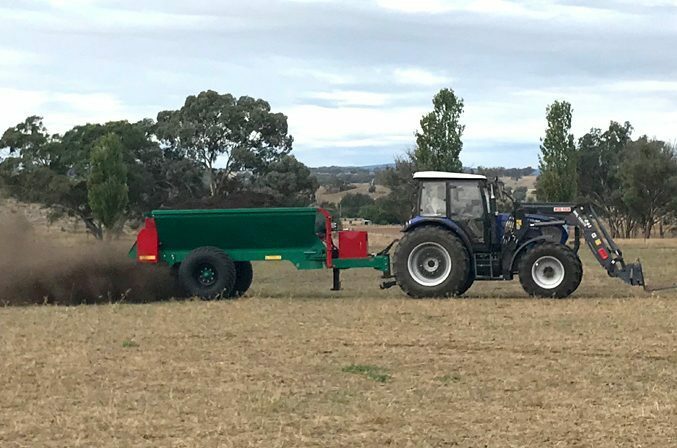 Farmtrac 9120DTN with pallet and bale fork combo, delivered to NSW. No reaching in! The side-pull release on the loader is fast & safe. Easy work with the Farmtrac's versatile 4-in-1 bucket. The Farmtrac 9120DTn loader has a massive SWL of 1330kg. The loader’s superior quick-release design allows for true single-person operation. As can be seen in the video below, the locking mechanism is conveniently actuated from the side – no reaching in required! Switching between the 4-in-1 bucket, pallet forks or bale grab is easy and only takes a few minutes. 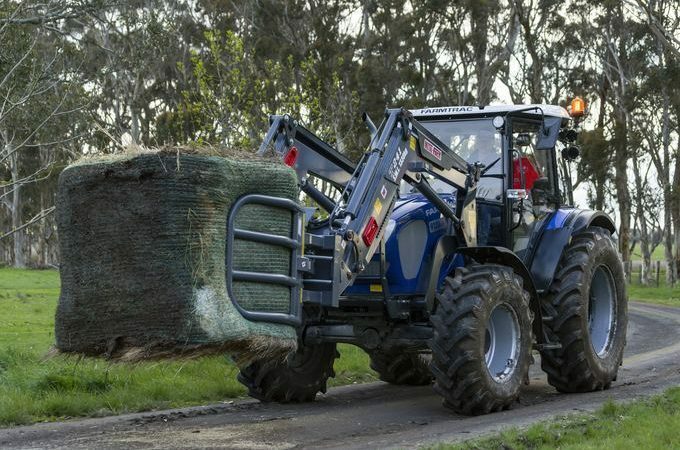 The Farmtrac FT9120DTn has large wheels, wide track & radial tyres for stability & traction. Rear LED work lights on the Farmtrac 9120DTn. We can tailor an implement package to your specific needs and budget. You can select from our huge range of implements to build the correct package for your requirements. Farmtrac 9120DTn with AGMAX heavy duty grader blade. Your Farmtrac tractor package is backed by SOTA’s high standard of customer service – we don’t forget you once you’ve made your purchase. Every tractor, loader and implement is fully inspected by our qualified technicians before leaving our warehouse. They are delivered to your property ready for use. Our delivery service includes an installation of your tractor by a skilled operator to ensure you properly understand how to operate your machinery. All tractors, loaders and implements come with a full warranty and operator’s manual. We have a full complement of spare parts on the shelf for your Farmtrac tractor and we respond promptly to your inquiries. You won’t be disappointed with a Farmtrac from SOTA Tractors! 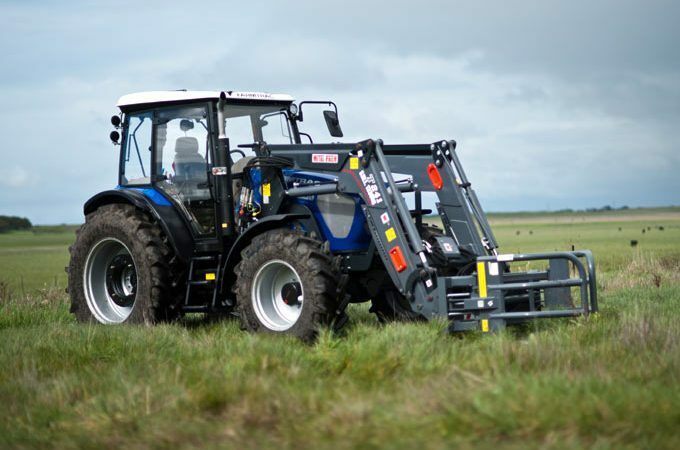 The Farmtrac DT series is a premium cabin tractor range that is manufactured in Europe. Boasting a world-renowned Perkins engine, Carraro transmission, Mita hydraulics and Bosch electronics, the Farmtrac DT series represents a premium tractor at a non-premium price. The Farmtrac DT series is built on a rugged cast iron chassis with a large, high quality wheel kit, including wheel weights and radial tyres. 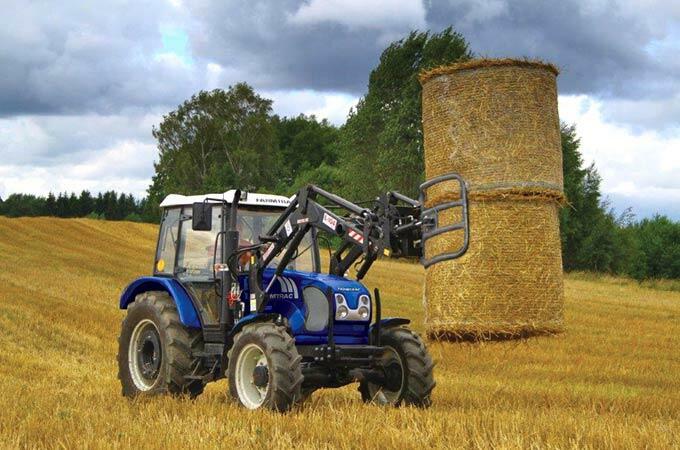 They are suited to commercial applications such as dairy farms and contracting. As the exclusive importer, selling directly to our customers, SOTA is able to offer these premium tractors at thousands of dollars cheaper than comparable offerings from our competitors. Laurie Gleeson – Killarney, VIC. Please visit our Testimonials Page for more feedback from our customers about their experience with SOTA Tractors.